As an average number, most Canadians have a personal debt of about $26,000. This does NOT include mortgages. With mortgage debt that number climbs to a staggering $114,000 per borrower. In more absolute breakdown terms, fully 70% of Canadians are in the red with debt and have ZERO net savings. The following graph shows that only 30% of Canadians have no debt, however that is probably the most optimistic number out there. 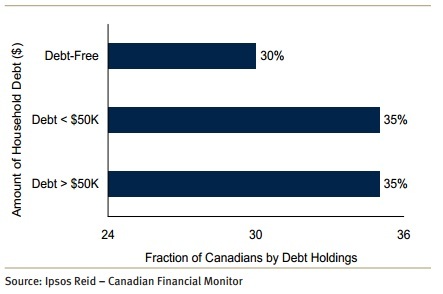 The actual number of Canadians who are debt-free is likely much, much lower. I’m guessing these numbers are more or less true of most G10 nations. What this means is, if a recession occurs, and unemployment rises, most….70%+ of people have little to no wiggle room in terms of personal finance. Over 50% of seniors are in debt….how does an unemployed senior pay off debt? Something is seriously wrong with the system…..A funny thing about human psychology, according to polls majority of Canadians are worried about their debt, but still think others are the real problem. Mass disconnect/denial. Most people are just blatantly not aware of how big the debt problem facing the world is. 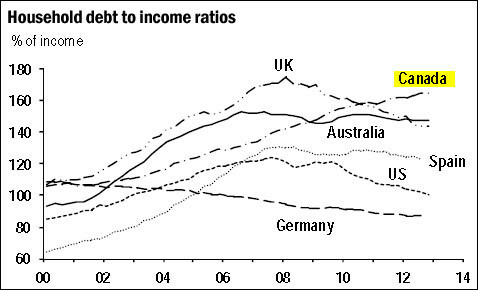 Canadians have recently overtaken Americans in terms of Debt-to-Income ratio. Canadians like to pride themselves in their fiscal responsibility however they are currently worse off than their neighbours when it comes to this metric. Canadian households as a whole now have a combined debt of over 1.57 trillion dollars. That is almost three times bigger than our federal government debt which sits at ~580 billion dollars which most people somewhat misguidedly obsess about. Bank economists like to throw around all kinds of other numbers showing how things aren’t so bad, however at the end of the day all I care about is how risk exposed are people if we enter another recession due to systemic problems in Europe, United States, Japan and a potential war with Iran. If unemployment rates begin to rise, what happens to 70%+ of Canadians who if they lost their job, couldn’t get another one, and have no savings plus are saddled with debt? A lot of people claim that Canada has a sound financial system especially compared to Americans. However I seriously question that claim. Yes maybe Canadian banks didn’t give out ninja loans as american banks did, but on the whole Canadian Banks have allowed/promoted Canadians to saddle themselves with an equivalent amount of debt. In fact looking at the total combined debt to gdp one finds that Canada’s total fiscal shape is within a few percentage points of the USA. 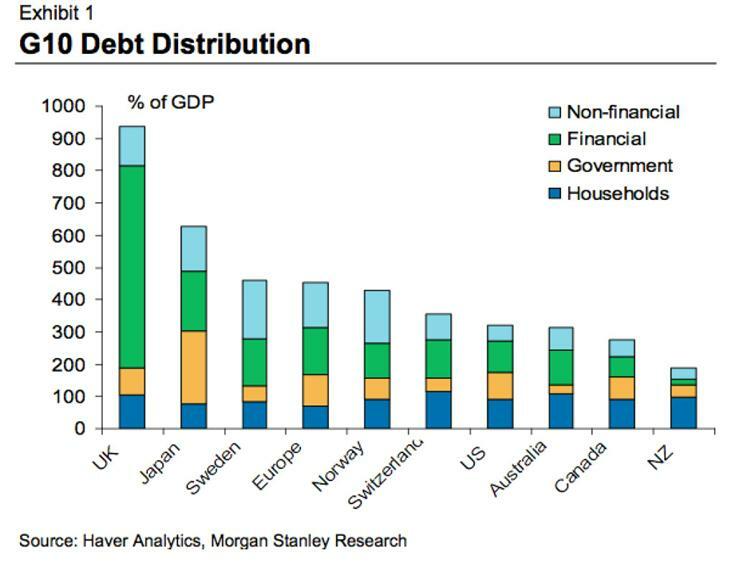 Canada sits at 283% deb-to-GDP while USA sits at ~300% debt-to-GDP. There has been a lot of optimism in the USA recently about how consumers are deleveraging and buckling down and saving. But is this really the case? Or are people just defaulting and private debt is transferring over to public debt as the following graph seems to indicate. Notice the circled areas. As private debt decreased (yay! 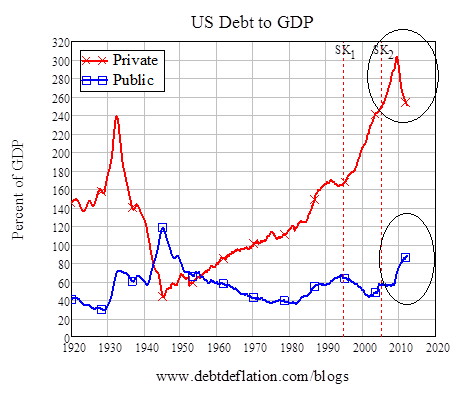 ), public debt simultaneously increased (oh no! ), indicating a transfer of debt from consumers to government. This logically makes sense, as consumers in the USA began defaulting banks bore the brunt of the burden. And then the government/taxpayers bailed out the banks by saddling themselves with debt. The debt didn’t go away….it just moved around. Now there is another systemic problem that Central Banks have created for themselves. And that is having lowered interest to near 0% it has predictably encouraged people to take on MORE debt. I mean mortgage rates are at historical lows, why wouldn’t you mortgage a house or several for that matter… If interest rates rise however, it has the potential of putting a sizeable number of people out of their homes and imploding the housing asset bubble Canada currently finds itself in. But Canadian Banks need not be worried….70%+ of mortgages are insured by the CMHC aka. the government. Our banks are safe, unlike those pesky Americans whose mortgages were insured by firms like AIG that went belly up. Our banking sector is at much less risk because YOU the taxpayer have insured the too-big to fail Canadian banks. (Sarcasm intended.) So thus in the end, should the housing bubble in Canada implode due to drastic external changes, taxpayers aka. you, will have to bail out our to-big-to-fail-banks. Were really not that different than Americans the risk just has a different flavour. “At its peak, CIBC received $21 billion in support — almost 1.5 times the value of the company at the time. BMO maxed out at $17 billion or 118 per cent, Scotiabank peaked at $25 billion or 100 per cent of its value, while TD and RBC maxed out at $26 billion and $25 billion — good enough for 69 and 63 per cent, respectively, of the total value of those companies at the time. Such low interest rates have a decidedly negative impact on the overall economy. Central Banks lowered them in hopes of stimulating the economy and giving it a boost towards growth. The problem is, the strategy didn’t work so well. What it does, is it rewards people who take out debt and it penalizes savers. Now that’s plain backwards and ultimately not sustainable. But If the central bank keeps interest rates too low for too long, savers lose more, and people just take out more debt since banks almost regulate themselves any-ways. Banksters are taking the public for a ride, and it’s a giant ponzi scheme. Most people as stated above….70%+ are in debt, so high interest rates do not benefit them. They have no savings with which to earn interest on! So now if the central bank wants to raise interest rates it will hurt more people than it helps. And the longer the central bank waits the bigger the problem gets for those that save, inflation is sure to eclipse any interest they earn on the money they hold perpetuating the debt problem. What does all this mean? It means that Canada as a nation is worse off than ever, and if the Europeans, Americans & Japanese can’t get their act together expect domino effects that will raise unemployment in Canada and people living off food-stamps will become the norm. Nations have been living on borrowed time and governments with their stimulus programs are kicking the can down the road trying to delay the inevitable.